Our Level Two Transmissions have all the wonderful features of our Level One Transmission, but they're built significantly to handle more horsepower, plus they feature quicker and firmer shifts. These units are still very street able, however, they should be installed into performance oriented cars and trucks. They will handle a steady diet of around 450/500 hp and 400/450 ft/lbs. of torque. This Level Transmission is definitely a huge step up from what the popular brand name companies' offer (according to their descriptions) and they still charge more! We have sold thousands of this Level Transmission over the last Twenty-one years with tremendous success. 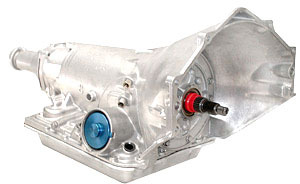 This is our most popular Level Transmission with years of refinement that's proven to be very reliable and tough in serious street performance vehicles. · Automatic fourth gear and manual converter clutch lock up system installed in all custom applications at no charge. The total shipping weight of transmission and torque converter in a wooden crate is 230 lbs.